We have extended experience treating auto accidents, sports injuries and home injuries using the latest healing instrumentation and techniques. All our techniques are painless and stress relieving without side effects. Refers to the types of chiropractic techniques that use mild or metered force to achieve chiropractic results. 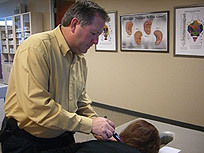 The Activator Method is an example of a gentle chiropractic technique. Also included are specific mild traction and muscle strengthening therapies and modalities. Doctor supervised weight loss system with remarkable outcomes, in most cases 20-35 pound weight loss in 40 days using low glycemic ant- inflammatory food. No cost consultations available, just ask our front desk! See our brochure on ChiroThin under the Brochures tab. Comprehensive laboratory testing and analysis. See your bio markers improve. Lab testing consists of a comprehensive blood panel, mineral hair test, and urine testing. The results are presented in a complete take home report providing dietary and nutrient suggestions for recovery and healing results. See our brochure on Science Based Nutrition under the Brochures tab. Low Level Laser Therapy (LLLT) uses advanced technology for pain elimination and dynamic healing. Used most often for joint, muscle, ligament, tendon and nerve rehabilitation. To see our brochure on laser therapy for pain, click here. Classes and materials for a healthy reduction of conflicts affecting the body’s health and well being. We encourage patients to learn these proven skills to reduce stress. Individual training sessions and group meetings are available. Immune system balancing using advanced computerized assessment providing energetic balancing for conditions such as chronic pain syndromes, fatigue, hormone imbalances, allergy symptom relief, and stress reduction within the body. Using Foot Levelers advanced 3D technology imaging to screen for imbalance and postural problems. Stabilizing orthotics are individually designed to help stabilize balance, and maintain the body’s function.